Kahuku's Malosi Te'o broke free from Farrington's Zeus Kakiva for a touchdown in the first half yesterday. The Farrington Governors certainly improved since a blowout loss at Kahuku last month. Unfortunately for the Governors, so have the Red Raiders. The Ka'u-Waiakea game at Wong Stadium was canceled due to unplayable field conditions. Parts of the field had 6 inches of mud. The decision to cancel the game was made Thursday and the game will not be made up, completing the Trojans' and the Warriors' seasons. Also in the BIIF yesterday, Konawaena defeated Keaau 37-22. In the Maui Interscholastic League, Kamehameha-Maui beat Maui 26-6. In the Kauai Interscholastic Federation, Kauai defeated Waimea 22-18. In close to a carbon copy of its regular-season victory over Farrington, Kahuku rolled into the Oahu Interscholastic Association Red Conference finals with a 35-0 win over the Governors last night at Aloha Stadium. 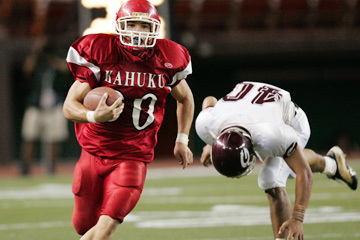 The Red Raiders' running game generated 287 yards and Kahuku scored on its first four possessions to take control. "They know what it takes to win, so they're concentrating on doing what they do best," Farrington coach Randall Okimoto said. Kahuku (8-1) will attempt to win its third straight OIA Red title on Friday against Aiea. Last night's semifinal win also assured the Red Raiders a spot in the HHSAA Division I state tournament, a title they won in 2000, '01 and '03. Farrington (5-6), which upset two OIA Red West teams to reach the semifinals, faces Waianae for third place and the league's last state-tournament berth. Kahuku relied on its ground game to take an early lead in its 43-0 rout over Farrington on Sept. 30 at the Red Raiders' field. Kahuku duplicated that dominance last night. "I think both (teams) have stepped up and we earned every score. They didn't just give it to us. They made us work," Kahuku coach Siuaki Livai said. With a beefy offensive line leading the way, Malosi Te'o rushed for 161 yards and three touchdowns and Kamuela Alisa added 78 yards and a score. The Red Raiders didn't attempt a pass in the first half, rumbling for 235 yards on the ground before halftime. "That was our plan; get in there, do our business, and play smashmouth," Te'o said. "Our line's incredible, that's the whole reason for our success." Kahuku's ground attack kept Farrington's offense on the sideline for most of the half, and the Governors gained just 44 yards in the half and 129 in the game. "Their defense is just as good as their offense so it's pick your poison," Okimoto said. Kahuku set the tone on the game's opening series as the Red Raiders took the kickoff and drove 80 yards in 14 plays. Alisa capped the lengthy drive by bursting through the middle of the Farrington defense for a 14-yard touchdown run on fourth down. Farrington finally got the ball with 4:16 left in the quarter, but was forced to punt and the Red Raiders again bulled their way down the field. Te'o scored on an 8-yard run around the right side to put Kahuku up 14-0 early in the second period. Farrington threatened to cut into the lead when Randy Villaver's 49-yard kickoff return and a Kahuku penalty gave the Governors possession at the Red Raiders' 26. But Kahuku stopped Farrington quarterback Elijah Filifili on fourth and inches and Te'o added to the Red Raider lead four plays later with a 71-yard sprint to the end zone. The Kahuku defense contributed to the scoring as lineman Kaniela Tuipulotu intercepted a Filifili pass and raced 71 yards to give the Red Raiders a 28-0 lead at the break. The Governors fumbled the ball away on their first play of the second half and Kahuku capitalized as Devin Unga's 28-yard reception set up Te'o's third TD run of the night. The game was delayed for about 20 minutes in the first quarter due to an injury to Farrington defensive lineman Taua Olomua. The junior was taken off the field in an ambulance as a precaution, but he later returned to the stadium. Kah--Kamuela Alisa 14 run (kick failed). Kah--Malosi Te'o 8 run (Alisa run). Kah--Te'o 71 run (kick failed). Kah--Kaniela Tuipulotu 71 interception return (Anthony Siilata pass from Kaulin Krebs). Kah--Te'o 5 run (Pele Soliai kick). RUSHING--Farrington: Kenneth Faumui 6-40, Elisha Faasu 2-14, Hercules Sula 6-6, Elijah Filifili 3-0. Kahuku: Te'o 16-161, Alisa 14-78, Devin Unga 1-19, Jason Mauai 1-14, Tuvili Tuisavura 2-7, Blane Beatty 1-5, Krebs 1-2, Pita Tanuvasa 2-1, Team 1-(-8). PASSING--Farrington: Filifili 11-21-2-65, Maeli Siliga 0-1-0-0. Kahuku: Krebs 1-1-0-28, Jacob Kahawaii 1-3-0-12. RECEIVING--Farrington: Tanner Fetui 3-10, Sula 2-25, Elijah Lesu 2-16, Faasu 2-3, Siliga 1-7, Faumui 1-4. Kahuku: Unga 1-28, Ian Fujinaga 1-12.